Do you like Adventures of Brave Bob? Share it with your friends. Adventures of Brave Bob is an excellent fighting game in which your task will be to help the knight named Bob save the beautiful princess that the dragon holds in his dark tower. 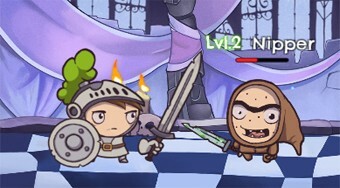 Move around the towers of the tower, fight with different enemies in one-on-one combat and get to the princess. Train your hero's combat skills and buy useful enhancements for your money.